Contact Joseph Mina (808) 328-8533. 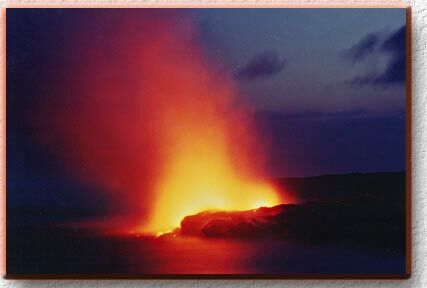 I invite you to a spiritual adventure of Hawaii Volcanoes National Park. Are you on a Hawaiian healing retreat or traveling the islands for personal renewal? We create with you a rejuvenating Big Island healing adventure at one of the most powerful places on earth! 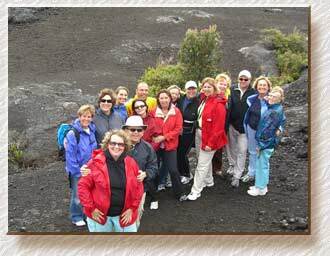 We customize spiritual tours of Hawaii Volcanoes National Park for your family, friends or special groups. The intention for this magical journey is "expanding your inner creativity". The primal energy of the park and its highly magnetic fields serve as a powerful catalyst for accessing this inner awareness. It was such a treat to have Joseph join us and lead us into areas I previously had not been to. After walking through hardened lava and around crevices, we walked through lush tropical forest and into a lave tube. Once deep inside, we turned off our flashlights and experienced the power of the complete darkness and silence. After our silence Joseph played the ‘Pua' a Hawaiian instrument. There in the darkness of the lava tube, hearing the enchanting sounds of the Pua and honouring the Spirit of the Volcano, well, you had to be there! Our day at the volcano is a long one, and we are all left with our individual profound insights. Our first stop is the Kilauea Visitor Center. Here you'll learn about the park's relationship to the Island's dynamics and geography. 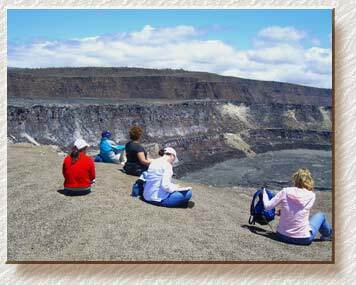 Next we visit the Kilauea Overlook of Halema'uma'u Crater, the home of Pele, the fire goddess. This is a place of extraordinary wonder and quiet reflection. Here we carry a symbolic offering (ho'o kupa) of "ti", a sacred leaf to the Polynesians. Through this symbol, the Hawaiian spirits know we come to honor them and show our respect for all they create. After lunch, our next stop is the lava fields of Mauna Ulu. Created in the 1970's, this area is unique in its diversity of lava formations, mineral content found in the lava and scale: a gem of the national park. Here, we explore the myriad forms of lava and stoke the fires of your inner creativity. Our last stop is magical wonder of the Thurston Lava Tube. Some 1,500 feet (500 meters) in length, this wonder of nature expands the non-seeing senses. Be prepared for magical surprises in the dark. Here, you explore the "inner universe", using the power of your senses, Nature and metaphor as your guides into the creative potential of the darkness. "Kathryn and Joseph's gentle presence were just the right sweetener needed for the recipe of success for my retreat. As retreat organizer and facilitator, to have their nurturing presence there gave me a chance to drink deeply while continuously serving others. Their unique skills added value for retreatants while deepening my own course of growth. Working with Joseph privately empowered with new contexts to hold and actualize insight rather than just think about it. They are a delight!" Leave Kona side 8:30 AM. If staying on Hilo side, please meet me at the Visitors Center at the Park at 10:00 AM. Voyager Tarot cards throughout the day to create context for "what's up" and manifesting new awareness in your life. Hawaiian ti bracelet - kupe'e - a spiritual sign to the Island Spirits you come to honor their presence. Intuitive sharing and insight about the personal metaphors appearing during your journey. **Expect changeable weather. The climate at Kilauea's summit ( 4,000 feet or 1,248 m elevation) fluctuates daily. Temperature (usually 80 - 84 F or 26 - 28 C in March at sea level) varies by elevation and generally 10 - 20 F or 5 - 10 C cooler at the summit than at sea level. Prepare for anything and everything! For everyone's safety and well-being, we create consensus with all who choose to participate. Clear safety guidelines are offered. Remember, "you are responsible for your actions on our Journey,"
Mahalo nui loa (thank you very much) for your interest and willingness to create magic.